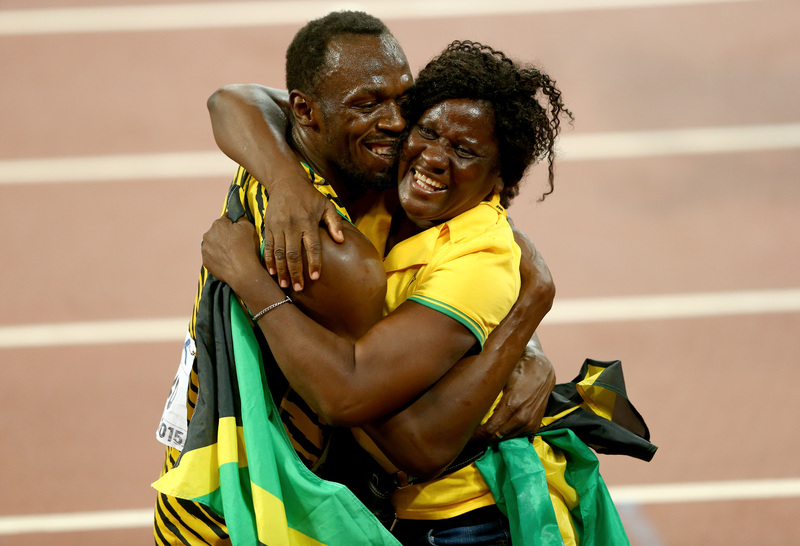 If there is one thing we can learn from Usain Bolt, it's that his mom is ultimately all of our moms, and it's pretty adorable. Not only is Jennifer Bolt ridiculously proud of her son's accomplishments, she's also ready for grandkids. Does this sound familiar? Or am I the only one that regularly dodges my mom when she starts asking when I'm settling down or if I'm thinking about kids? Jamaica's greatest Olympian has had a stellar time in Rio at the 2016 Summer Olympics. Bolt has snagged two gold medals, been snapped in what will surely be one of the most infamous Olympics photos of all time, and has taken some time to celebrate his accomplishments with a little dance on the track. But if Bolt's appearance in Rio is potentially his last, does that mean he's thinking about settling down and starting a family? With Bolt confirming that he'll be retiring after Rio, the future is wide open for the Olympic sprinter and a family could be in that range of possibilities. Jennifer Bolt is certainly ready for the (probably lightning fast) pitter-patter of baby Bolt feet, telling the Huffington Post that, "[t]he challenge now is to find him a lovely wife. The medals can take care of themselves," and adding is a very universal "Mom" fashion that, "I want him to settle down, because I don’t want him to be alone. I’m not rushing him, but he knows I’m ready." Bolt himself has yet to comment on whether or not a family is in his future, but I don't doubt that all the pieces are in place for him to go the paternal route. Bolt's paternal instincts are very present on his Instagram, where proof of him fawning over his godson are sprinkled into training, Olympic, and celebrity meet-and-greet photos. You take one look at the above pic and tell me you're not melting with joy over the godfather love Bolt has for his godson. His comfort around kids is also very real and present through his own foundation, the Usain Bolt Foundation, which works to "to enhance the character of children through educational and cultural development, as they live their dreams." Bolt echoes this through his social media documentation of meeting and working with various youth groups, proving he's focused on giving children a brighter future and that he has his potentially family-oriented priorities in order. Even though Bolt may have a girlfriend (their social media sightings and her avid support of him on Twitter are the receipts to an otherwise unconfirmed relationship), and there is no crystal ball predicting whether she may be "the one," the runner himself may be more family-ready than we might expect. Bolt's comments on retirement indicate he is focused on the future, whatever that may entail. When it comes to starting a family, that mindset — along with a preternatural comfort around kids — is just the kind of mindset that could make Jennifer Bolt a very happy grandmother... someday.